Celebrate the 45th anniversary of Hello Kitty with a special anniversary sticker set! It’s loaded with lots of Hello Kitty cuteness to say thanks to all of her fans. Friend Hello Kitty’s official account to get the set for free. 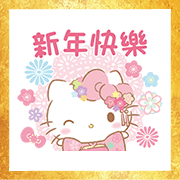 Hello Kitty is here to wish you more year-end greetings with these special Chinese New Year-themed stickers. Mimmy and Dear Daniel are also here to celebrate! 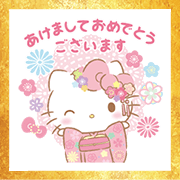 Hello Kitty is here to wish you year-end greetings with these special Japanese New Year’s-themed stickers. Mimmy and Dear Daniel are also here to join in the fun! Omikuji lasts from December 27, 2018 to January 3, 2019.